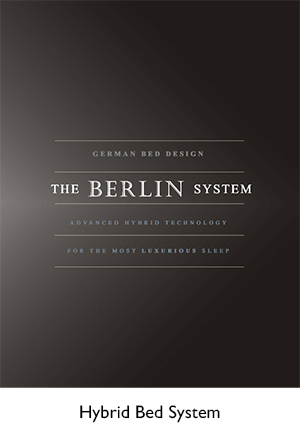 European Beds, German Bed Systems, LA Bed Store. You can review our FAQs below or email your question and look at a list of downloadable documents further below in .pdf format. 1. How does an Axel Bloom system look in a bed frame? Each can be purchased separately or in a combination. The attached photograph illustrates how each combination looks when assembled. 2. Do you have any assembly instructions? Yes, we have assembly instructions in PDF format. Click on the links below in the bulleted list for instructions. You will need Adobe Acrobat Reader to view the files above. Please click here to download the program. 3. Do you have to use an Axel Bloom bed frame? No, you can keep your existing bed frame. Please see our Bed Design and Installation Guide for more information. 4. Do I have to use your mattress? No, but it is recommended to use a mattress which is designed to fold. For the electronic adjustable system, we suggest a mattress no thicker than 10 inches. 5. How does your system work? We have 3 components: mattress, bed base, frame. 6. What are the various product attributes of Axel Bloom mattresses? Click here for a list of the mattress features. 7. What are the differences between your bed bases/suspension systems? Each suspension system has been carefully developed to suit a specific need. Please refer to the attached chart to compare the features of all our adjustable suspension systems. 8. How are your wooden bed frames constructed? Our wooden frames are made from solid wood with two layers of 1/8th inch thick veneers (1/8th inch on each side, consisting of two layers of 1/16th inch) with a wood core of Spruce. This inner core is made from alternating wood grain patterns so that it is resistant to expansion from heat or moisture. Typically, the wood is nominally 7/8th to 1 inch. Hence it is a stable structure and does not deform. Click here to view a sample cross section of our bed frame construction. 9. Why is it better? Axel Bloom mattresses are designed with multiple layers of foam with channels etched on the surface flexing appropriately depending on which part of the body is resting on the mattress. 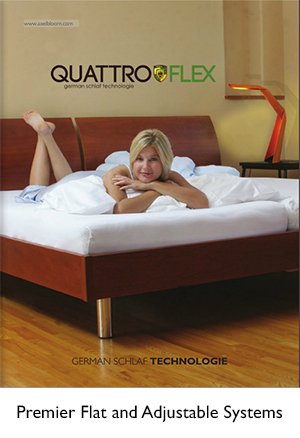 Axel Bloom's Slat System reinforces mattress support for proper spinal curvature while the body is at rest. The Slat Systems feature a wave-like spring action gently supporting the body at rest and adjusting to body movement throughout the sleep cycle. The more complex slat and pod construction provide both lateral and longitudinal motion support. Air holes create circulation keeping the mattress fresher while wicking away perspiration. Quilted mattress cover is designed as a breathable second skin. Mattress cover can be washed and dried to remove perspiration and dust mites. Warm mattress systems keep the heart working increasing blood flow, never allowing the body to fully rest. Axel Bloom mattresses work to stay cool keeping heart rate steady and reducing interrupted sleep. Mattress cover easily unzips in two parts for machine washing and drying. High quality foam and robust construction eliminate the need to turn the mattress. Mattresses are made in two sections making them easy to lift, change sheets and move from room to room or house to house. Slat Systems are designed so air moves freely and dust particles do not collect making cleaning easy and discouraging the growth of dust mites. Slat Systems are in two sections so they are light and easy to move. More than 55 years of design and manufacturing experience. Made in an advanced factory and assembled by Austrian craftsmen and women. Yes, we specialize in custom beds. You can keep your bed frame and have us make you a mattress and bed base to your dimensions. Typically, a custom bed cost about 15% more than our sale prices. 11. What sizes do you offer? We have a full list of US and European sizes. US sizes include: Twin XL 38"x80", Full 54"x75", Queen 60"x80", Eastern King 76”x80", Cal King 72"x84". We also offer all European sizes and we can customize to any size. 12. Do you have a warranty? Yes, there is a 10 years limited warranty on mattress and 3 years limited warranty on bed bases. Please refer to our Terms & Conditions. 13. Where are your showrooms? Our main showroom is located in Los Angeles, California, just north of Wilshire Boulevard, five minutes from the intersection of the 405 Freeway and Wilshire. 14. What if a showroom is not located in my area? We are very experienced guiding customers on the phone to select their sleep systems. We deliver a substantial number of bed systems outside of California and to international destinations from Los Angeles or from our factory in Austria. If you wish us to advise you, please call us directly at 866.696.8387 or email us at customerservice@axelbloom.com. You can then submit your custom configuration to us so we can contact you to help you further. You may also submit any questions and download design documents at our contact section. 15. Why are there so many choices? As a bed specialist, we offer a range of choices. Everyone is shaped differently in height and weight distribution. Our body aches are also different and therefore the type of body support should be unique for each person. 16. Which mattress/system is superior? We offer many solutions for your special sleep comfort. Depending on your needs, you may purchase a mattress alone or all three bed components: mattress, mattress suspension system and bed frame. This choice of each component will make a difference to your sleep experience. Finally, do visit us so we can assist you. No, we do not offer returns, but we can offer help to understand the pros and cons of each bed component before you make a purchase. We welcome you to come visit our store and try out our beds as many times as you'd like to find one that is suited for you. 18. What if I would like a wood type not offered on the frame style of my choice? Yes we can customize that as well at an extra cost. It would still have to be a wood type which we carry for our other bed frames. 19. How do I wash my cover? Cold or warm wash and low dry or hang dry. 20. How often can I wash my cover? Once a year is normal.